Borbély, A., & Caputo, A. (2017). Approaching Negotiation at the Organizational Level. Negotiation and Conflict Management Research, 10(4). https://doi.org/10.1111/ncmr.12106. Burton, R. M., Obel, B., & DeSanctis, G. (2011). Organizational Design: A Step-by-Step Approach. Cambridge University Press. Retrieved from http://books.google.it/books?id=1lLwLznKAbcC. Caputo, A., Borbély, A., & Dabic, M. (2018). 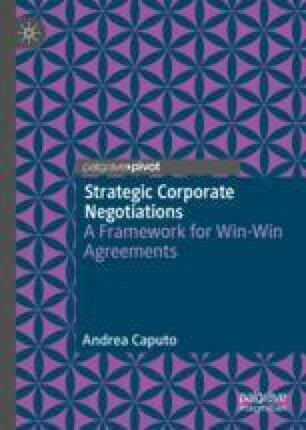 Building Theory on the Negotiation Capability of the Firm: Evidence from Ryanair. Journal of Knowledge Management. https://doi.org/10.1108/JKM-02-2018-0117. Child, J. (2005). Organization: Contemporary Principles and Practice. Wiley. Retrieved from http://books.google.it/books?id=4jZsQgAACAAJ. Paton, P. R. A., & McCalman, J. (2008). Change Management: A Guide to Effective Implementation. SAGE Publications. Retrieved from http://books.google.it/books?id=HA0FQOWx8ngC.